La La Land director Damien Chazelle is already planning his next move with a TV Drama about the Paris music scene. He won Best Director for La La Land earlier this year, but now 32-year-old Chazelle is heading up ‘The Eddy’; a musical drama set in modern day Paris. The musical will centre on a club and its owner along with the house band and the unpredictable city they live in. ‘Harry Potter and The Cursed Child’ writer Jack Thorne will write the project. Glen Ballard, the grammy-winning songwriter who co-wrote Alanis Morisette’s album ‘Jagged Little Pill’ and Michael Jackson’s single ‘Man in the Mirror’, is attached as an executive producer along with ‘Six Feet Under’ director Alan Poul. The project’s owners, WME, are reportedly shopping around both cable and streaming outlets for release. 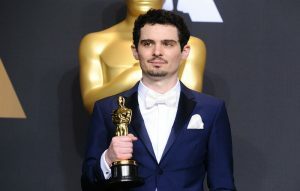 With his Best Director win at the Oscars in February, Chazelle became the youngest winner of the category ever for his contemporary musical set in Los Angeles. Emma Stone took home the gong for Best Actress and the film won another 10 awards – but not Best Picture, despite the film’s title being called out as the winner of the category over rival ‘Moonlight’. Chazelle will team up with Ryan Gosling once more for an upcoming biopic on the late Neil Armstrong. Chazelle gained notoriety for writing and directing 2014’s critically acclaimed film ‘Whiplash’, starring Miles Teller. The post La La Land director plans TV drama about Paris music scene appeared first on NME.